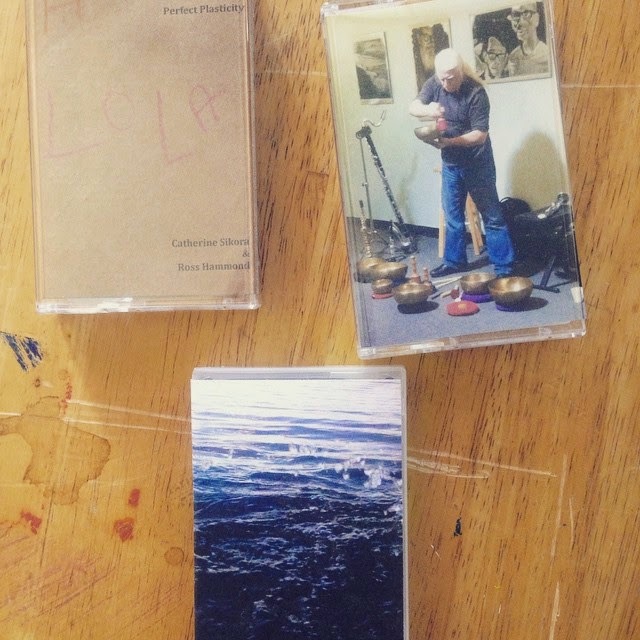 Gold Lion Arts, a music space and studio in Sacramento, California, is releasing three cassette-only recordings made in house. Featuring some of the most noted central and southern California improvisers, each of these recordings are very limited, and not scheduled for digital release. Recorded in the summer of 2014, Solo Guitar is a mere 13 minutes of Ms. Reed scraping, strumming, and rubbing strings. She makes use of extended techniques, found objects in particular, to evoke alternating brightness and darkness. Often, her style results in two related voices simultaneously jangling, or one sustained while the other speaks. Her tone is usually clean, but she turns up the distortion toward the end of this single track for a more aggressive, yet still thoughtful, finale. Vinny Golia needs no introduction. On this two-track, 30-minute recording, he plays reeds, flutes, and singing bowls. Golia begins with the latter, eliciting an otherworldly feel. He lays down angular lines, rapid trills, and slow-morphing held notes. The combination of clean playing with distorted tones is a juxtaposition that benefits both approaches. Perfect Plasticity features guitarist Hammond with frequent collaborator Catherine Sikora on sax. This duo trades off between solos accompanied by drones, and dueling leads, across four tracks. Sikora is known in the experimental community as a player of great creativity, while Hammond seems comfortable in a variety of settings, from guitar-driven fusion to more left-of-center work. Often, Sikora is the dominant voice, improvising clean lines while Hammond strums or picks in the background. Thus, rather than a free-form blowout, Hammond and Sikora take a more subtle approach. A whole new texture is evoked when Hammond switches over to acoustic guitar on the third track. The longest recording of these three, it is perhaps the best place to start.